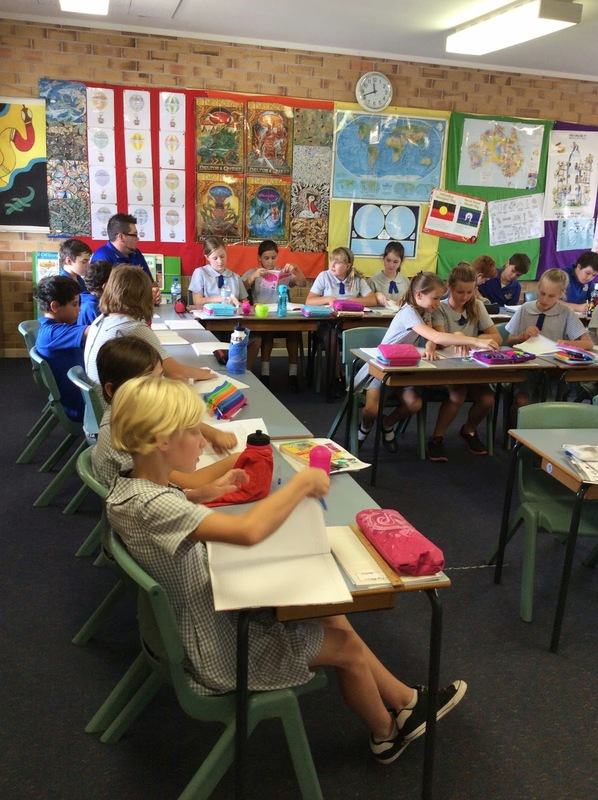 For week 8 of #TeacherTuesday we are in New South Wales, Australia. This is now where I live, along the northern coast area, just below the Queensland border, below Brisbane - see the map below. In physical terms the school featured this week is relatively close to where I live - see the red marker on the map for the school location. The teacher is Russell, and the school, Ross Hill Public School, is in Inverell in the northwest. It is a New South Wales country town. It has a population of about 680 students from kindergarten to year 6. 5 – 12/13 year olds. At my school they are all English speaking and we currently we have a new curriculum coming which should have Indigenous language in it which means we’ll have to teach it to our kids at school. Last year I had one boy in my class who could speak five languages. But we predominantly teach in English. We have 18% Aboriginal students at our school. Poverty draws a line in the sand. You’re on one side or the other. It’s hard. That’s why I don’t set homework on a computer as I know some still don’t have computers at home, and that’s disadvantaging them. I accept it on a piece of paper. I don’t mind how it comes back as long as it comes back! Aboriginal kids don’t necessarily live in more poverty than Non-Aboriginal kids. It depends where you live I think. These all tie into what the union was fighting for – an education review to get all schools to be funded to the minimum level with extras added on for low socio economic kids, children with disabilities, Aboriginal children. That’s started and is being built into our schools at the moment. The battle’s still going though. The money doesn’t always come. It’s supposed to be over a six year period. I am actively involved in lobbying for this. I am an Aboriginal Councilor on the New South Wales Teachers Federation. It was the biggest educational review we’ve had for an age. A lot of the class sizes are big – kindergarten should be 20 students - it’s big! You learn not to sit down! You don’t have a chance to sit down! And as they get older, the classes go up. I can have up to 35 kids in my classroom. So you need teaching aids – specialized teachers who can take a group of kids to give them a boost in literacy or mathematics. The challenges Aboriginal people face are still there today and we need to recognize these as a whole society, we as a people are still not recognized in or own constitution as the first peoples of this country. When I was at school it was sometimes difficult going to school with non-aboriginal people as if I was in a classroom and someone didn’t want to sit next to me, I could be asked to move place. That was in the 70s. Now, some of those Aboriginal children have children of their own and in their mindset, education tormented them, so it’s hard for us to get these parents into school. Some aren’t exposed to the written form of English before they go to school – books and that sort of thing. They hear the spoken language but they’re three steps behind before they start. They’re playing catch up from day one. Some Aboriginal children don’t go to preschools. I’d say you’d be lucky if 50% of your Aboriginal children had been to preschool. A lot has changed over the past couple of years a lot of the teachers have changed even. Their attitudes have changed. A lot of teachers still find it hard to teach Indigenous children in the classroom. Not because they don’t know what to teach, it’s that they’re afraid to do the wrong thing – to teach something incorrectly when it comes to the Aboriginal perspective on something. They’re nervous. They want to do the right thing but they don’t want to offend someone. If they describe a country or a land and name it wrongly or the history of the country, for example. When it comes up in the media it’s actually really hard in the classroom. Because the kids know the media half the time faster than I do. They’re linked into everything! So as a teacher we need to keep up with all events and technology. A lot of Aboriginal students don’t even finish high school. They get side tracked. I was the first person in my family ever to do a university degree. In my state, you cannot leave high school until you are 17 years old and you have to have a job or apprenticeship if you’re going to leave before then. They’ve upped that age limit from 16 years. And the high school syllabus has changed to incorporate trades in it and stuff. High school 2 days, tech school for 2 days and work for one day. So they’re working and training while finishing their schooling. Quite a good move. The way it works for teachers is if you work in certain places you build up points and the more points you get it puts you higher up the transfer ladder so when you teach at the more remote schools you get 8 points per year, compared to 1 point on the coast, so it’s worth 8 years for a job on the coast! You can get a rent subsidy in some western areas. There’s an imaginary line so if you’re on one side of that you get an extra week’s holiday because of the heat too! A lot of the western schools have a lot of beginner teachers. A lot of teachers come out here because of the incentives but leave after three years, some not all. They come straight from uni. After the 3 years out here they go to teach on the coast instead and live and retire there for the rest of their lives! So there’s a high turn around in these areas. In my last school I was there for three years and had done relieving work before then, and I was the third longest serving teacher in the school. There’s such a high turnover so the kids don’t learn to trust you. It takes at least 12 months for them to trust you. There are scholarships now as well so you have to agree to stay for 3 to 5 years or give back your scholarship money. I wanted to be a teacher when I was at school because I wanted to prove people wrong and show I could do it. It took me a long time. I was accepted into university but turned it down. I was a lifeguard for 16 years. Then I was a teacher. I’m in my seventh year now. I should have done it 15 years ago. I love it! When I was doing my lifeguarding stuff I was still doing stuff for schools – teaching swimming and first aid. Still involved but not a classroom teacher. 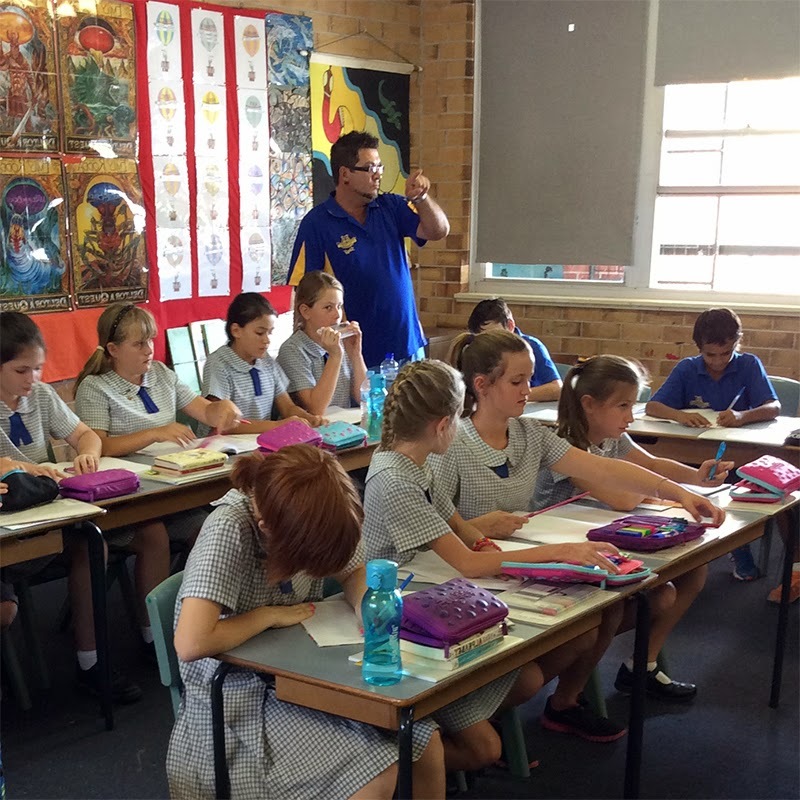 Aboriginal education is compulsory in teacher training, but we can chose electives which are special interests. I choose a couple of Indigenous ones there. I did a double weighted project to raise literacy standards of Indigenous boys in a small coastal town in New South Wales. It was confrontational as I pulled apart the syllabus to say that I didn’t think it was working for those kids – they were falling further and further behind because what was being taught wasn’t interesting to them. The syllabus didn’t suit their needs. It was too regimented. These boys were more creative, not just mind wise. I got them to learn English through drama and role plays. They got up and acted it out as they didn’t like to be still. The new syllabus has better cultural references in it I’m pleased to say. It has compulsory Aboriginal perspectives in it. You don’t have to write in words, you can write in paintings now, for example. I’ve had my students pull a story apart about the drought of the basin – a big river system here – and I got them to paint it with Indigenous symbols rather than write it. They’re using a lot of terminology out of there. We have to teach music as part of our syllabus so I try to teach a mixture of indigenous music woven into rap music. As an example I use a didgeridoo artist that plays rap through a didgeridoo! I interweave Aboriginal with modern, and I do that with dance as well, incorporating both. It is important that our children don’t lose their cultural heritage. A recent UNSECO report highlights the learning gaps that persist between indigenous and non-indigenous students. "The difficulty indigenous children face is one reason for the wide gaps in learning between rich and poor students in Australia and New Zealand. Though these gaps are clearly visible in student assessments, they have not received sufficient policy attention, and so have persisted for a decade and a half. In Australia, around two-thirds of indigenous students achieved the minimum benchmark in mathematics in grade 8 between 1994/95 and 2011, compared with almost 90% of their non-indigenous peer"
Teacher training - The need to include indigenous subjects and raise awareness. Teacher incentives - as mentioned in past #TeacherTuesday posts, providing incentives for teachers to be in a rural area, and to feel comfortable teaching there, is a challenge. Russell is teaching in his 'home territory' therefore feels comfortable. Many teachers in Australia will not, unless forced, teach in the country - a familiar story in many countries. What to teach! We have the Australian Curriculum being implemented from Foundation to Grade 12. This is a major step in helping to unify the country (a state-based education system also engenders inequality) and provide a common core curriculum. It also focuses on the capabilities of 'Intercultural Understanding' and 'Information and Communication Technology'. However Russell shares essential objectives to integrate different cultures into how and what you teach, taking a broader rather than a narrower approach. "Aboriginal kids don’t necessarily live in more poverty than Non-Aboriginal kids." reminds us that we need positive action not only for indigenous students, but also for all students across Australia who are living in poverty and statistically are not achieveing as well.